Sacraments celebrated at The Episcopal Church of Saints Andrew and Matthew include baptisms, weddings and funerals. 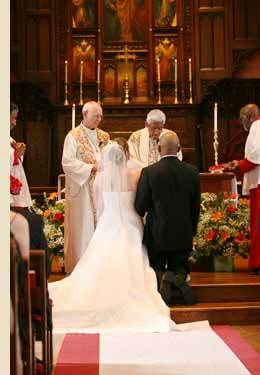 Weddings at the Episcopal Church of Saints Andrew and Matthew are usually held on Saturdays. In most cases, it is desirable that at least one of the couple have an affiliation with the church. All couples are required to participate in several sessions of marital preparation prior to the wedding. For details, click the two links below. At The Episcopal Church of Saints Andrew and Matthew, we believe marriage is a holy and sacred celebration. It is a joyful proclamation of the love between a man and a woman, and the blessing of Christ on that union. Our congregation joins you in celebrating marriage as a sign of love and a blessing of that union. Weddings at SsAM conform to the traditions of the Episcopal Church and, within those traditions. If you desire a marriage, union, or blessing of a civil marriage, please look at our guidelines and then contact the Rector at the number given below. Premarital counseling is required for all persons. Couples must first make application to the Rector or designated Priest at least sixty (60) days in advance of the proposed ceremony, and before it is actually booked on our schedule. There is a schedule of fees for services such as the costs of building use, clergy, sexton and musicians. At SsAM, the ceremony in which a marriage, blessing or union takes place is a service of worship. For more information, to check for availability, or to request an appointment, please call the church office at (302) 656-6628.